Schoolzone | Where will the budget 'bonus' be spent? Where will the budget 'bonus' be spent? It probably won't come as much surprise to most teachers that two thirds of schools will simply lose the additional funding in paying off deficits, or else it will be absorbed into staffing or maintenance costs. "We still need to pay for core provision due to squeezing of core budget - 'little extras' is a deeply dismissive and patronising phrase for a sector struggling to maintain core provision of staff, books and building upkeep," said one secondary school leader. 15% of schools said they'd spend it on resources - but just 2% would target intervention spending. So, no great windfall for education suppliers. The IFS note (in Socio-economic differences in total education spending in England: middle-class welfare no more) that the spending on children from poorer families now exceeds than on those from better off ones. 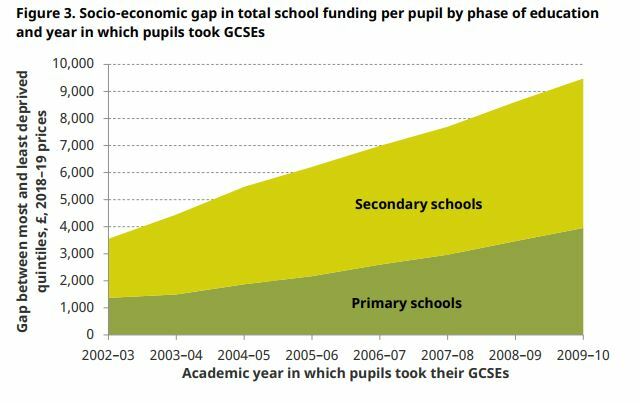 This partly down to PP funding, which resulted in parity in 2010 across the whole of education. However, the main difference really seems to lie at 16+. Nowadays, virtually all students stay on, owing to the raising of the school leaving age, whereas in the past it tended to be children from better off families who did so. And (so) more HE students are coming from poorer backgrounds. It’s also worth noting that children from poorer backgrounds are also more likely to go into the (until recently) less well funded FE sector, rather than sixth form. This is a really interesting report, read it here. Also interesting to note, is the extent to which parents are supporting their children’s schools. 43% have been asked to make a regular financial contribution to their child’s school, up from 37% two years ago. 36% say they make donations (up from 29% in 2016) and 11% donate more than £30 a month. This according to research from Parentkind. Parents are also increasingly aware of cost-cutting measures in schools. A growing number report that teaching assistants (TAs) have been cut and the length of the school week reduced, and many say clubs and events that once were free now have to be paid for. This report makes for rather grim reading.